This is the MLT-10 a 7 day movement. The weights and cabling are not shown. This movement ran on 7.5 lb during it's test runs and kept very good time. The minute hand on the left, hour hand on the right, and the second hand above. The time can be set by turning the intermediate wheel. 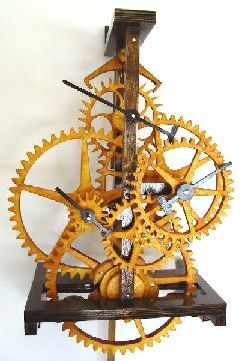 It has a graham escapement with a seconds hand. The time train incorporates three rolling pinions made out of brass. This reduces engaging and disengaging friction between the teeth of the wheels and the pinions.